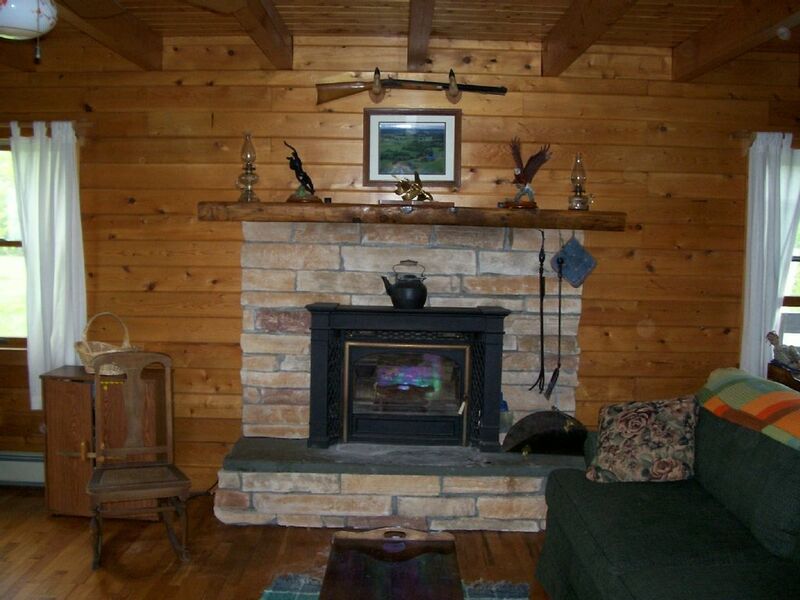 Secluded vacation log home on 170 private acres just 70 miles north of NYC in the Hamlet of Wallkill, Mid Hudson Valley. Front porch overlooks a large recreational pond for fishing, rowing, swimming or skating. Trails to hike, cross country ski or ride. Wildlife abundant in fields. Minutes to the Gunk (Shawangunk Mountains) for world class climbing. Gorgeous views from every direction. 3 bedroom, 2 full baths, large living room, dining room and kitchen. Sleeps 12. Plenty to do in this beautiful area. Things to do: Rock, Ice climbing / sky diving / hand gliding / hot air balloon / horse riding / vineyards / West Pointe / River Cruise / stock car racing / performing arts / mansion tours / antiques / art galleries / fish, hike, cross country ski, row, swim, skate, ride. This property is too beautiful not to share. A perfect place to unwind. From beautiful views to an abundance of wildlife to enjoy. Sit on the covered porch during a storm, watch the geese land in the pond, rabbits chasing each other along the hedge row, deer grazing and the sound of the owls and coyotes lulling you to sleep at night. Two full baths, plenty of towels. 400' x 80' kidney shaped pond. DSL and Verizon MIFI Available with allocated amount of data per visit. Ask if you have any questions. We are in the country. Must Be 21 Years Of Age Unless Accompanied By A Parent EXCESSIVE CLEANING NEEDED, i.e. STOVE TOP, OVEN, POTS AND PANs and FLOORS, WILL BE DEDUCTED FROM DAMAGE DEPOSIT. Please take care of our pots, pans, stove and oven. Thank you. Please do not use items on top of kitchen cabinets, decoration only. Thank you. Really nice property away from any roads. Plenty of sleeping and room to relax. We truly enjoyed our stay! The house was clean & stocked with all necessary items. The property is beautiful & very peaceful. Exactly what we wanted. Mike was a wonderful host checking in with us prior to our arrival & after our departure. Property owners Mike and Michelle are very responsive, friendly, and conveniently nearby. The property has beautiful views of the Shawangunks and the Hudson Valley. Shopping is conveniently near, and all our favorite walks at Minnewaska and Sam's Point are close by. The property itself is very comfortable, and the farm and pond -- even when cold and snow-covered -- are a pleasure to walk around. We had a great time and will be going back. Great place to go off the grid (if you want to ) and enjoy quality time. Only 90 minutes from NYC metro area. Great cabin with great fishing and view. We just packed up and on our way home from staying here for our wedding! Everything was perfect! Definitely want to come back for another weekend get away! We had our bridal party stay on the property with us for the weekend! Thank you Mike & Michelle for everything! !